Norwood Insurance Group, a Texas-based insurance and financial planning agency that provides coverage to business and residential clients all across eastern Texas, is joining the Irving Cares organization for a charity event aimed at supporting underprivileged and homeless families in the region. Since 1957, the Irving Cares organization has been committed to providing critical services and support to families in need throughout the greater Dallas County area. 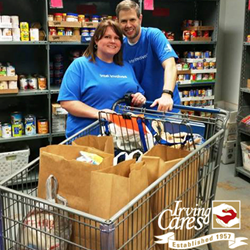 Programs provided by the Irving Cares organization include a food pantry for hungry families, financial assistance for financially burdened families to meet rent, mortgage, utilities, or prescription obligations, and an extensive employment services program. “The Irving Cares charity drive is about more than helping out our fellow Texas citizens, it’s about giving families the tools they need to rise above their circumstances and retake control of their lives,” says Wes Norwood, founder and director of Norwood Insurance Group. To publicize the Irving Cares charity event and gather support from area families and business owners, Norwood and his team are utilizing a dedicated social media platform and implementing an email bulletin system for local community leaders. As well, Norwood Insurance will be featuring the Irving Cares organization in an upcoming edition of “Our Hometown,” a monthly online magazine produced by the firm: http://www.norwoodinsurancegroup.com/Our-Hometown-Magazine_42. Followers of the Norwood Insurance Group may already be aware that the agency has recently joined the “Agents of Change” movement. As part of this involvement, the firm is committed to finding and assisting another new Texas-based charity or nonprofit every 60 days. Those interested in taking part in the Irving Cares charity event alongside the Norwood Insurance Group are encouraged to visit this page and make an effort to support to the cause: http://www.norwoodinsurancegroup.com/Helping-Underprivileged-In-Irving-Earn-A-Living_19_community_cause. Those who want to review information on previous charities and nonprofit organizations assisted by Norwood Insurance Group can find an up-to-date listing of the firm’s Community Causes here: http://www.norwoodinsurancegroup.com/community-cause. With offices in Irving, TX, agency owner Wes Norwood knows many local families, and his knowledge and understanding of the people in his community help him provide an outstanding level of service. Wes and his team look forward to helping families protect the things that are important to them - family, home, car and more. Norwood Insurance Group can also help clients prepare a long-term strategy to achieve their financial goals. To contact a courteous and knowledgeable expert at the Norwood Insurance Group, please visit http://www.norwoodinsurancegroup.com/ or call 972-756-0065.